FROM MDAH RELEASES — Toyota Motor North America has made a $750,000 contribution for the Mississippi Department of Archives and History’s 2 Mississippi Museums project. Toyota’s donation will advance programming at the Museum of Mississippi History and create the Toyota Gallery at the Mississippi Civil Rights Museum. FROM MDAH RELEASES — The Old Capitol Museum begins the new year with a Luminaries and Legends Hall of Fame spotlight exhibit celebrating Mississippian John Roy Lynch. 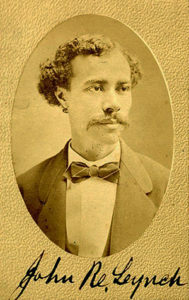 Lynch (1847-1939) became one of the first African Americans to serve in the United States Congress. Born into slavery across the Mississippi River from Natchez in Vidalia, Louisiana, Lynch rose quickly in the world of state and national politics after the Civil War. He was a member of the Mississippi Legislature from 1869 to 1873, serving as Speaker of the House of Representatives. During that time, he and his fellow Republicans spearheaded many longstanding initiatives, including the creation of public schools in Mississippi.